The Daily Transcript honors San Diego's top corporate counsel selected by an independent judging panel. View the 2012 finalists here. Headquartered in San Diego since its beginnings as ProFlowers in 1998, Provide Commerce is a leading online provider of high-quality gifts backed by superior customer service. The following is a list of this year's judges. The University of San Diego's fourth annual Climate & Energy Law Symposium, titled “Law in a Distributed Energy Future,” will examine emerging law and policy approaches to encourage and accommodate distributed energy solutions. Being a member of the legal profession demands diverse excellence. Kelly Capen Douglas, general counsel for the University of San Diego, has consistently delivered in this capacity since she arrived at the institution in 2005. 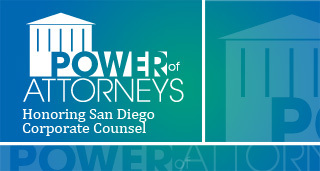 Power of Attorneys 2012 pays tribute to San Diego County's top corporate counsel. Selected by an independent judging panel, these attorneys exemplify leadership, dedication and achievement, community involvement and commitment to diversity in the profession. NEW YORK — Avon Products Inc.'s legal woes may finally be on the wane. NORTH SIOUX CITY, S.D. — Beef Products Inc. sued ABC News, Inc. for defamation last week over its coverage of a meat product that critics dub "pink slime," claiming the network damaged the company by misleading consumers into believing it is unhealthy and unsafe. Law school students or recent graduates who wanted a position as an in-house counsel used to have to work in a private law firm first. The America Invents Act, the historic patent reform legislation that was signed into law by President Obama last September, is being rolled out in three stages. NEW YORK — The distinctive red soles of Christian Louboutin shoes are entitled to trademark protection, even if the company can't exactly call the color its own, a federal appeals court said earlier this month.